Capacity: 3 tons to 30 tons of mixed municipal solid waste. We can conduct your visit to one of this operational machine in Navi Mumbai. We provide different types of hoppers with wear abrasive plates, according to the need of customers. We are offering a premium quality collection of a feed Hopper to our customers. Also, customers can avail these hoppers in bulk quantities at competitive prices. Hopper unit for threading m/c, wadding m/c, embossing m/c for automatic feeding. Ask for PriceLoading Hoppers are custom made to match the waste processing capacity. 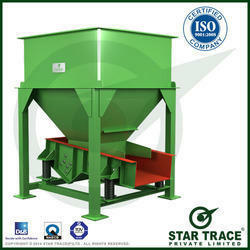 We are a fast growing manufacturer, Distributors, supplier of international quality standard Hopper feeder. These cushion tacking machines are immensely used to create a variety of tacks on fiber filled cushions and ensure uniform and even filling. Keeping in mind the varied requirements of our honored clients, we are involved in manufacturing and supplying a wide range of Feeding Hopper. The Apache feed hopper comes in a range of sizes, 2m to 4m silo diameter and from 0.5 ring to 4 rings in height. This range of silo is designed for the storage of granular feed and the capacities range from 2 tonnes to 50 tonnes. We manufacture Different designs of hoppers according to the drawing and sketches provided by the Customer. With the able assistance of our team of professionals, we are indulged in providing a wide range of Feeding Hopper that is available in numerous specifications. Offered hopper is manufactured using premium quality raw material and advanced machines. This hopper is checked by our quality controllers on well-defined parameters.